Slovak bagpipe is a variety of a typical instrument of Central and Southern Europe, which ranges from Croatia through Hungary, Slovakia, southern Poland highlands, Serbia, Romanian Banat, to Ukraina in the east. In mediaeval times, however, its range extended as far west as Catalunya and south of France, where we can still find its remnants, as for example "boha" of the Grande Landes of Gascogne. The basic feature is the double chanter (gajdica), with one pipe for melody (abeceda) and other for its rhythmical accompaniment (kontra). Both of them are drilled in a single piece of wood and sounded by means of single reeds. The melody pipe has five fingerholes in the front side, and two thumbholes on the rear side. The compass is one octave. There is no hole for 7th, as this tone is skipped in most of our traditional music, but it can be crossfingered as shown in the chart. The kontra has one fingerhole, and its lower part extends into the attached resonating bell (roÅ¾ok). It plays basic (A) with the hole open, which is in unison with the bottom tone of the melody pipe, and the lower quart (E) when closed. By altering these two tones, rhythmical patterns are created. 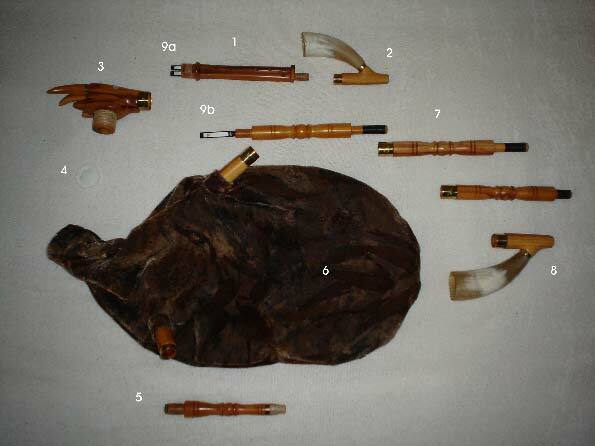 The chanter is placed in a goat head-shaped stock (kozička). The third voice of the bagpipe is played by the drone (huk), giving a single A two octaves below the chanter's basic. The drone has three parts and terminates in a horn bell. The bag (mech) used to be made from raw goat, dog or sheepskin in the past. Nowadays we use processed hide, from which the bags are glued, not sewn. The air is supplied by means of a blowpipe (chlipÃ¡k), which has a horn mouthpiece and a common valve. The music played on slovak bagpipe is a dance music. It has a strongly marked rhythm, mostly in 2/4, Â¾ and 4/4, based on alternation of powerful intervals, i.e. E-B / A-c sharp. This is performed by a rhythmical movement of whole lower hand, while the upper hand does the gracing. Even slow rubato tunes and songs are often rhythmised when played on pipes.